February and March were hectic and blessed months in the ministry! The balance of February was spent on a trip to Rafiki Foundation in Eustis, Florida. Rafiki uses classical Christian methods in African orphanages. They write their own curriculum and train their own teachers. www.rafikifoundation.org We were then on to Tallahassee to visit Christ Classical Academy for Grandparents Day. CCEI, Inc board members, Elke and Kevin Long’s children attend this classical Christian school. 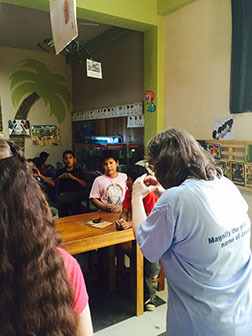 In March, Christy Anne and mission partner Richard Hendricks visited the Christian Learning Center and Library in Puerto Maldonado, Peru run by Missionary Ventures International Field Coordinators Jim and Sue Brannan. They had asked for teams to bring school supplies and small toys for prizes for the 80-100 children who had read books and written book reports all summer (in Peru the seasons are opposite ours so school is just starting for the year). Some children had written book reports all year to earn points to spend on “market day” at the free library or Biblioteca Christiana. No teams came through. We stepped into the gap and many of you generously donated school supplies, funds and toys on very short notice. Thank you! Above: Field Coordinator Sue Brannan (in red) and CCEI, Inc. missionary Christy Anne Vaughan with mission partner (not pictured) Richard Hendricks teach an integrated, Christ-centered lesson using magnifying glasses, Bible verses about magnifying the name of the Lord and a song about magnifying the precious name of Jesus – in English and in Spanish. A take-home coloring sheet as well as gummy feet (“walk with Jesus” on the wrapper) were given to those who attended the class. 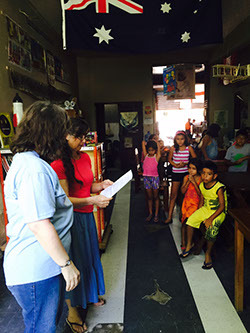 While CCEI, Inc. has the stated mission to serve classical Christian schools, the work in Puerto Maldonado fits as the Brannans do teach from a classical Christian perspective. Over time, they adapted from a fee-based Christian school to a free public Christian Learning Center format and are now serving more students and families than ever. They received pamphlets on classical Christian educational methods from our team and will share them with a family of missionaries who feel led of the Lord to open a free Christian school in Lima as soon as God provides. Praise the Lord that our willingness to go has multiplied the impact! Mission partner Richard Hendricks will be flying down to the Adventure Learning Center and Camp in Nassau, Bahamas to take more computers and a projector to the Christian nature center and planetarium. We visited the ALC in the fall and took down two computers for the staff there to upgrade to Windows 7. He will donate his time but his ticket should run a couple hundred dollars for airfare. If you can donate to this cause, please make a note on your check that your donation is for the ALC trip. Above: Richard, of Compusec, with Tim Seeley of Adventure Learning Centre in green shirt. 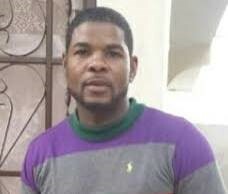 Our friend Pierre Louis (below) has found a building in Haiti’s capital in which to reorganize his orphanage. Pierre and Boynton Beach youth pastor Joel Bresil operated an orphanage in Gonaives, Haiti that was destroyed by the tragic 2010 earthquake. Pierre is securing beds and furniture for the home and asks for your prayers and any help in partnering with Father House of the Children Orphans in Haiti. CCEI, Inc. has pledged to give classical Christian training to Pierre’s teachers and supply educational materials when the project is underway. If you feel led to give to this work, please mark your gift payable to Haitian Bethel Baptist Church of Boynton Beach, FL. We will make sure it gets to the church marked for the Haiti orphanage. Those of you who gave at our Gospel Sing where we introduced Pierre and Pastor Bresil will be glad to know those funds (given through the church) have helped secure the building in Port Au Prince, Haiti. Upcoming prayer needs: The Association of Classical and Christian Schools annual conference is June 18-20 in Dallas, Texas this year. http://accsedu.org/conferences/annual-conference We encourage you to attend. Leaders Day pre-conference is June 17 and is only $100 right now for early bird registration. Please also be in prayer for start-up schools in Palm Beach County and Fort Myers, Florida as well as increased enrollment for Grace Christian Academy in Merrick, New York (Long Island). Praises: While international travel can always have unexpected turns and trials, the trip to Puerto Maldonado, which is in the Peruvian jungle near the Bolivian border, was delayed but not destroyed when our flight was diverted to high altitude Cusco and we were stranded for 24 hours. We each experienced altitude sickness and required medical attention. God delivered us and we were able to leave the next day and complete our mission. Hallelujah and thank you to our prayer partners for lifting us up in our time of trouble. Nothing is impossible with God! Also, please send us your prayer requests so we can pray for you! Let us know if we may share them with our board for additional prayer support.